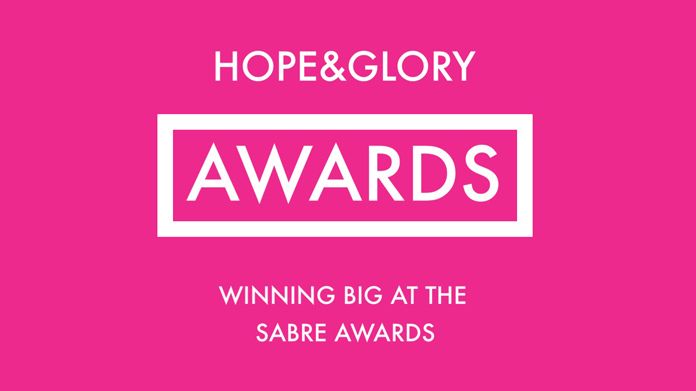 The Hope&Glory team headed out last night to see what was what at the Sabre Awards 2014. A jolly night out at London’s Roundhouse spoilt only slightly by the nervous tension that always sets in when you’re waiting to find out whether you’ve won anything. As it transpires, we needn’t have worried as the lovely people at the Holmes Report named us EMEA New Agency of the Year – which is a remarkable accolade when you think about it really. It’s down to an awesome team here at H&G, which has swelled to 28 fantastic PRs, all of whom are delivering some top quality work. Then we bagged a trio of awards for client work, which is after all what we actually get out of bed to deliver. O2 was recognised for our O2 UpCycle campaign (Best Telecoms) and for our work with them on their Chargers out of the Box initiative (Best Corporate Image) while Meantime Brewing was awarded Best Consumer Marketing for Hops in a Box. Amazing work all round really. We never really thought that, when we set out to start this little agency – back when it was Jo and me (James) sitting around a couple of desks with laptops, phones and sod all else – that we would become such a big team of talented people quite so quickly. But it’s down to their excellence that we’ve got to where we are. Oh … and while we’re patting ourselves on the back (c’mon, we’re proud of what we do, bear with us) we’re also heading down to the PRCA DARE Awards in early-July as our work for O2, Meantime and The Royal Mint is up for gongs at the event down in Brighton. The Meantime Hops in a Box work is up for Best Social or Digital Campaign, O2 UpCycle is up for Best Consumer Campaign, Best Technology Campaign and in the “Campaign Challenges” category and The Royal Mint Silver Pennies work gets the nod for Best Public Sector and also for Best Consumer Campaign. Nailing six nominations in five categories is a brilliant result. We’ll let you know how we get on in six weeks or so.